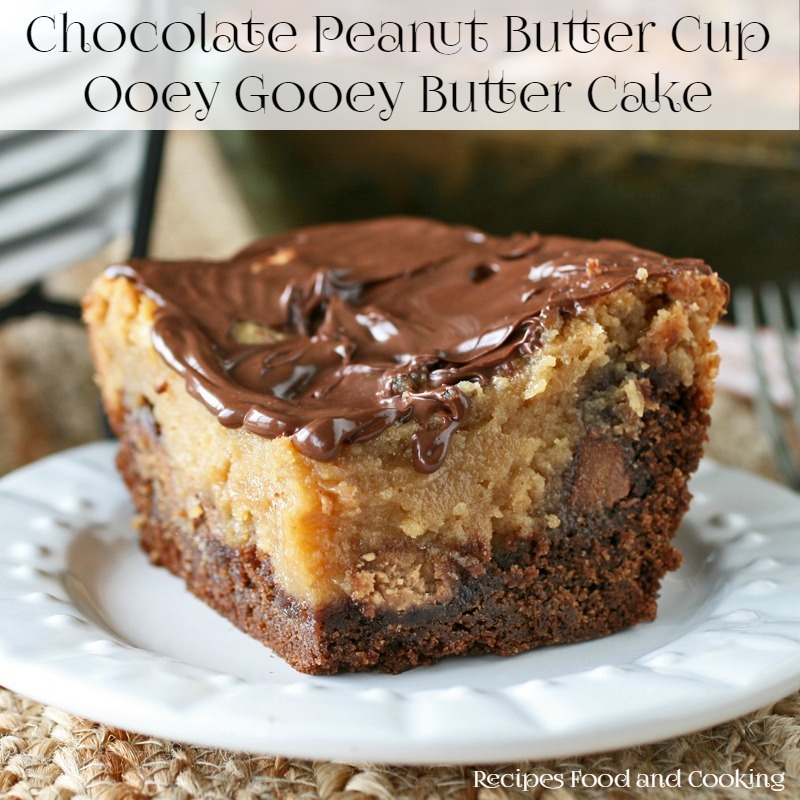 For the chocolate and peanut butter lovers in your family, this Chocolate Peanut Butter Ooey Gooey Butter Cake if sure to become a family favorite dessert. 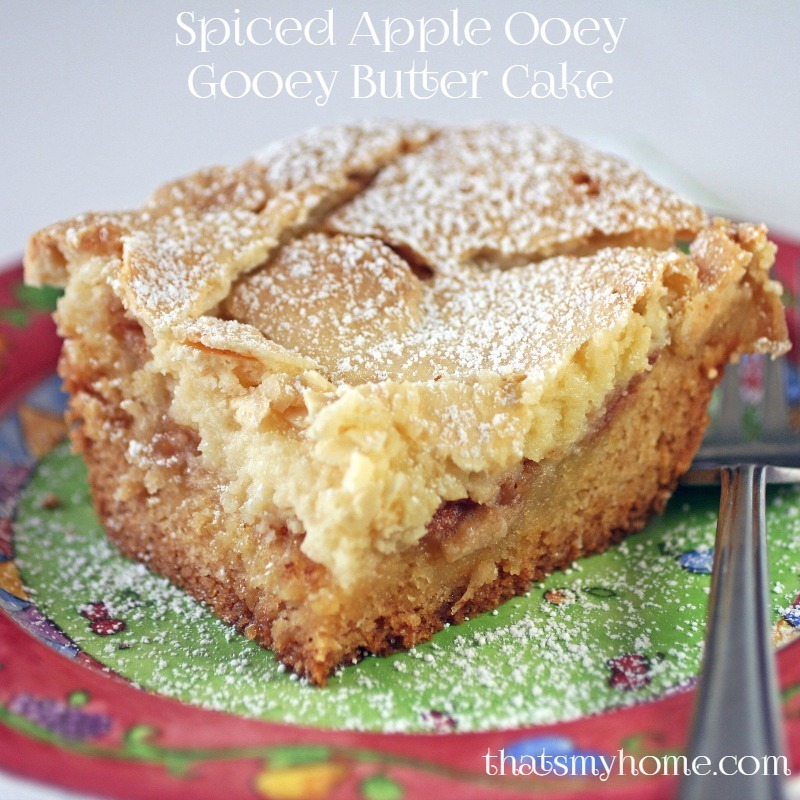 This may be my favorite Ooey Gooey Butter Cake yet. I get lots of emails usually after Halloween and people are looking for a way to use up their leftover Halloween candies. This cake will have the kids begging you to take their Reese’s Peanut Butter Cups once you make this for them. You can use any candy you want, I used a mixture of peanut butter cups and Butterfingers for a little crunch. The cream cheese layer is packed with peanut butter flavor and then topped with more chocolate. Ooey Gooey Butter Cakes are fast becoming the dessert of choice at my house, this is my third one in as many of many months. 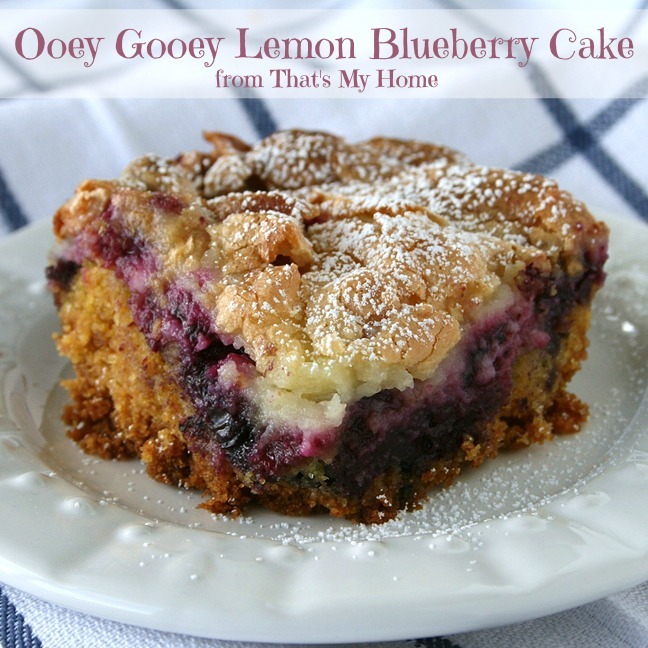 I never thought anything would replace the Ooey Gooey Lemon Blueberry Cake I made a few months ago but this one, OMGosh is amazing! I started with a German Chocolate Cake Mix, only because it was the only chocolate cake mix the store had of the ones that were on sale. Use whatever chocolate cake mix you desire, it won’t make a difference. Reese’s Peanut Butter Cups and Butterfinger Candy Bars were added on top of the cake mixture. This was all topped off with a layer of peanut butter cream cheesy goodness. Finally a layer of chocolate was added. You could take this cake anywhere, make sure to bring a copy of the recipe. Combine the cake mix, egg and butter together. Beat until it is combined. Spray a 9 x 12 pan with cooking spray and then put the cake mix layer over the bottom. Pat it down. Cut the large peanut butter cups into 4 pieces. Roughly chop the Butterfingers. Spread evenly over the cake layer. Combine the cream cheese, vanilla and peanut butter together until combined. Add the eggs one at a time and mix them in. Add the butter. When this is all combined together add the confectionery sugar. Spread evenly over the candy bar layer. Bake for about 50 minutes. I used a glass pan and it took just over an hour. The mixture will be puffed up in the center when done. It will jiggly just slightly. Remove from oven and let cool. Melt the chocolate for 1 minute in the microwave. Add the oil. Stir until combined. Spread over the top of the cream cheese layer. Update 12/21/18: Because of the density of these ooey gooey cakes it can sometimes be difficult to tell when they are done. 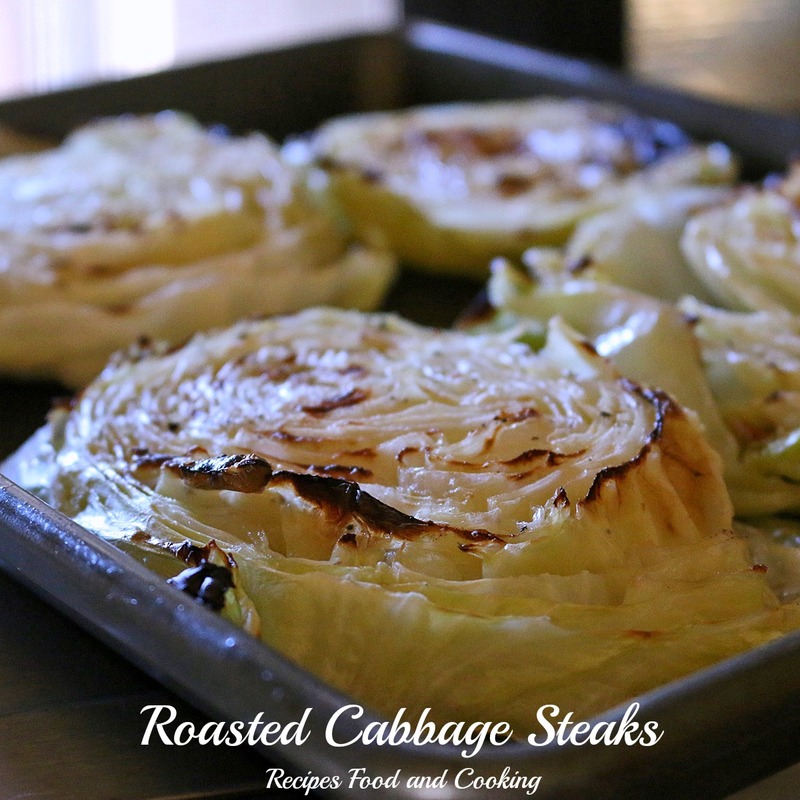 They are done when they reach 210 degrees on a digital thermometer. The tester when inserted should pull out clean. There seems to be a bit of confusion because I used a German Chocolate Cake mix, that is all it is, you could use a chocolate cake mix if desired. I just happened to have a box German Chocolate Cake mix the day I did this. There is no frosting in the box just a cake mix. Note: This cake will not be set until it is puffy in the middle. Because these cakes are so dense the baking time will vary from oven to oven. If you are baking it in a glass pan, bake it at 325, it can take as long as an hour and 20 minutes to bake. A tester will pull out clean also when it is done. Note 2: Use the largest peanut butter cups you can get. You want them to cover the the bottom of the cake layer. I cut them into four pieces. You could also use a bag of mini’s. You just want to be sure there is a piece of the peanut butter cups in each bite of the cake. If you aren’t going to use the butterfingers with it substitute with a few more peanut butter cups. The butterfingers do give it another texture. They really do compliment the peanut butter cups. Maybe you’d like to one of our other Ooey Gooey Butter Cakes? Sure that would be great. I am following you now too. You could just use peanut butter cookie dough for the bottom layer or you can use yellow cake and use peanut butter chips to melt for the topping. 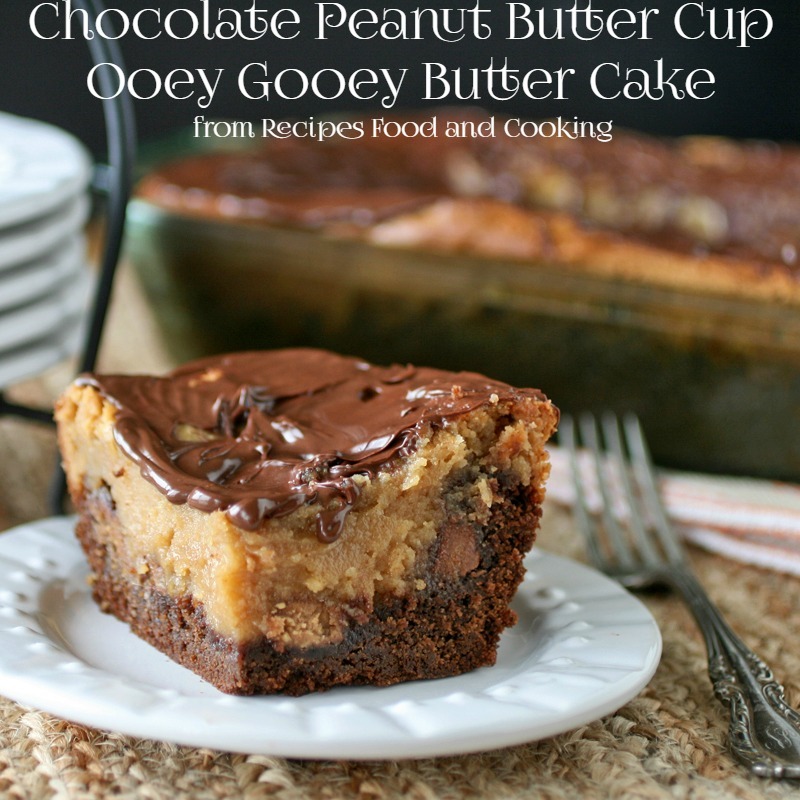 It’s then the peanut butter ooey butter cake there are so many variations to this recipe. You can use so many flavors and make it your own. Mary Ellen! I HAVE to share this with my son Christopher! He is going to love it. Looks so sinfully delicious! It is sinfully delicious! It melts in your mouth, I hope Christopher enjoys it. The name alone makes me want to try this. Delicious! OMG….so much yum in one cake! You sure do have a way with the ooey gooey! Thanks Renee! I am getting ready to do one for Christmas….. stay tuned. So what was the Christmas one? These all look delicious! I know there are gluten free cake mixes you can buy. I’m not gluten free so not sure if anything else in the recipe has gluten in it or not. Let me know if something else does and we’ll see if we can figure it out. Ohmygoodness!! Now that is a beautiful cake!! 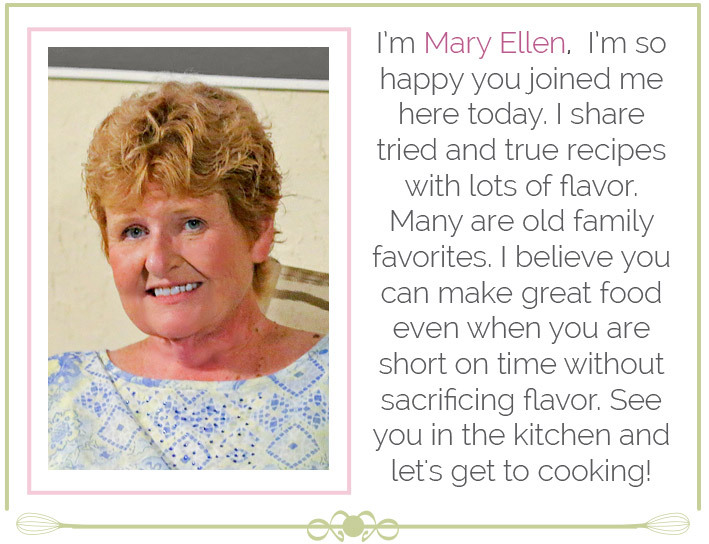 Your picture is killing me, Mary Ellen!! and when I saw it has Butterfingers I nearly fell off my chair! I LOVE Butterfingers. Gotta make this, but I don’t think I can be trusted to be alone with it! I got half of mine out of here as soon as I had pics. I love the crunch of Butterfingers and if you cut the snack bars into 4 -5 pieces they didn’t melt into the cake. So you got some crunch in the cake too. This looks out of this world! Wow, this sounds amazing! I love every single layer of this cake – can’t wait to try it! What size pan do you use for this cake? I can see why this is your favorite! 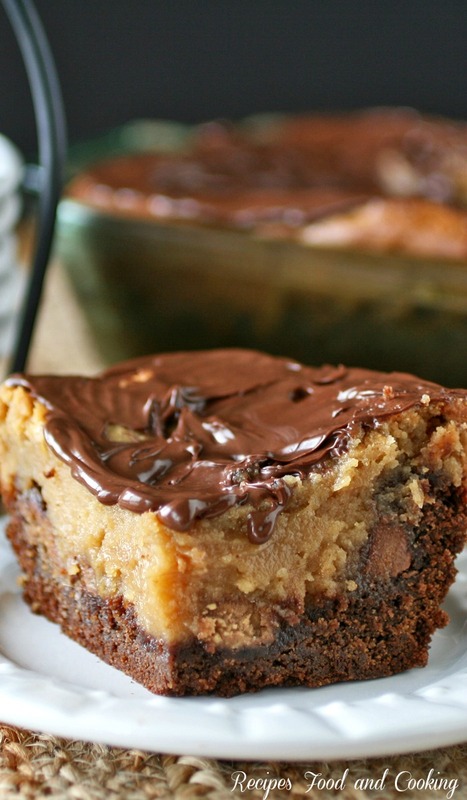 I never have trouble eating all the peanut butter cups, but I still want to make these! Yum. I would, it has cream cheese in it. I’d take it out of the refrigerator about an hour before I planned to serve it. How do you store this cake? I kept it covered in the refrigerator. 4 cups of sugar seems like a lot! Most Ooey Gooey Cakes have 4 cups of confectionery sugar. I have safely cut back to 3 with some but have not tested that with this recipe. If you do, let me know. I’ll try it with 3 cups the next time I make it. Would like to clarify the sugar. You use powdered sugar in this recipe? This peanut butter cake looks perfect! I think it would be a huge hit at a Super Bowl party too! Thanks for the recipe. I’ve yummed it for later! Hi. This looks amazing! However, I don’t see the recipe anywhere. I am switching themes and it appears to be a glitch. I am working on it. Do you also use the coconut nuttopping that cones with the german chocolate cake for this recipe? Thanks! Kris – I’m confused because this cake uses a german chocolate cake mix. 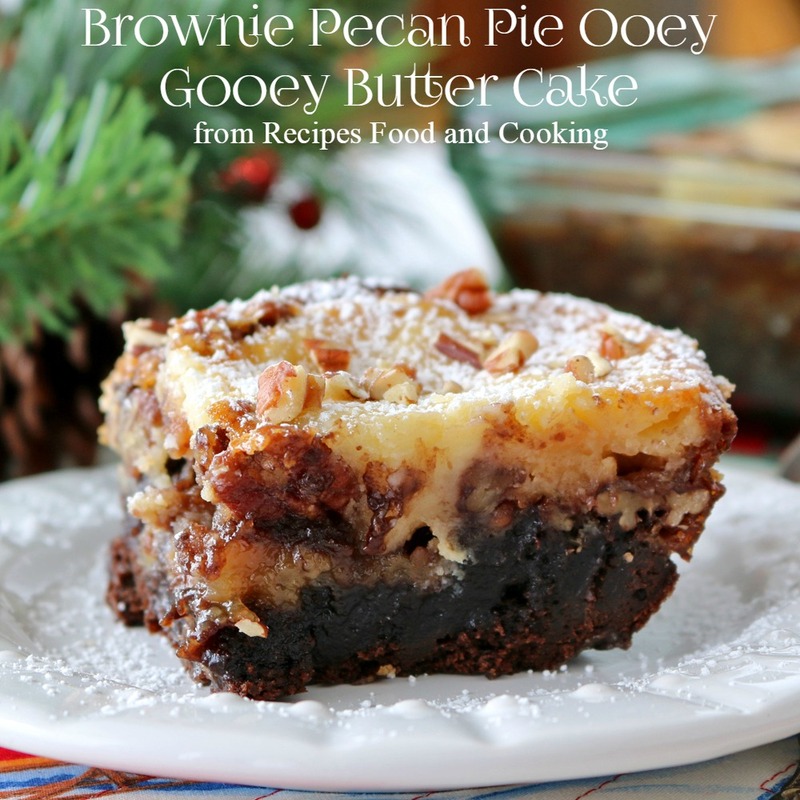 Did you meant to ask this about my pecan ooey gooey cake? If so no it doesn’t use the coconut nut topping. I don’t think I have any recipes that use that. Email me if you want and I’ll try to figure it out. Mary Ellen, the recipe states to use a box of german chocolate cake mix. I was actually planning to ask the same question as Kris and saw she beat me to it. So it should be brownie mix instead? I answered her wrong so glad you asked. This one I used a German chocolate cake mix. I used a brownie mix on the Pecan ooey gooey cake. Sorry for the confusion. I made this cake and it seemed like the center never got done I had to put foil over the top so the edges wouldn’t burn. Did I do something wrong? I fallowed the direction to the tee!! Did you bake this in a glass pan? If so the oven should of been turned down 25 degrees. All I can think of is your oven is hotter that mine or the pan was the issue if it was glass. Anytime I see that happening I usually turn down the oven too if I had to add foil to keep the edges from burning. We good recipe, we just had it for dessert ! We be making that again, thanks for the share! I am making this for dessert tonight. 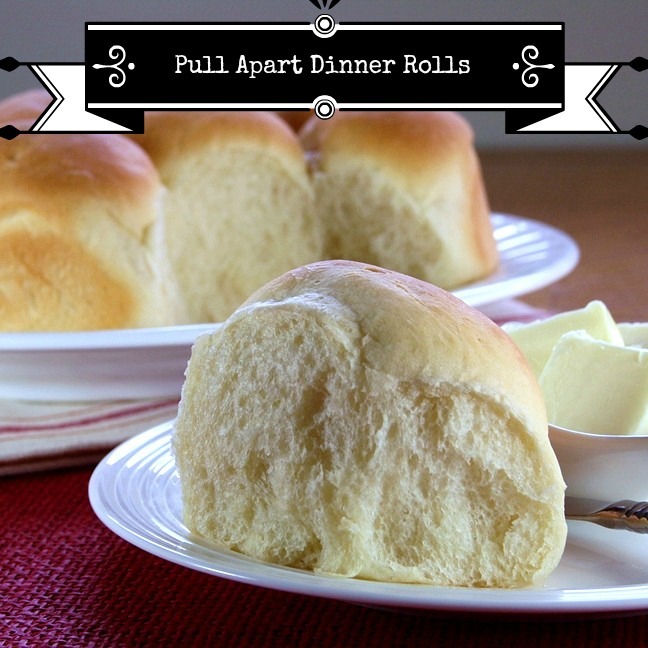 My grown kids all come over once a week for Sunday dinner and they are going to love this! I’ll let you know how it goes! I’m not sure how it would turn out. can you east mascapone? That might substitute well. I made this yesterday, as a birthday cake for my mom to take to my aunt’s house today, we celebrate it on Easter…. It was SO TOUGH not digging into it to try…. LOL… I cannot wait to eat it! Thanks for the recipe!!! Hope you enjoy it Stephanie! I was confused as well on the German chocolate ingredient. I had to get on here and look for a comment that might address it. The German chocolate mix comes in two parts. The recipe does not specify use cake mix part only. I had actually taken the cake batter mixture back out after picking off the candy pieces thinking that I had left out part of the cake mix. I hope I am doing it correctly. We will see. It looks good. I may even have to eat me a bite of it . The German Chocolate Cake Mix I used is only one part, just like any boxed cake mix. No frosting, no other parts just the cake mix. I think it is a Betty Crocker Cake mix but until I go to the grocery store I can’t be positive. You could use a regular chocolate mix also if desired. I just happened to have this one that day so I used it. I’ve never seen a German Chocolate cake mix with 2 parts. I hope your cake turned out okay. Happy Easter! I am making this cake right now and it looks delicious! Thanks for the recipe! Happy Easter! Happy Easter to you too Brandy! Made this for Easter. My son said it was like a Reese’s Cup on steroids!! Yum!! LOL…. glad you enjoyed it! I was looking for something yummy for my sister-in-law’s birthday cookout this Saturday and I think I just found it! I can’t wait to cook it and see what everyone thinks. I can’t eat it because I am allergic to peanuts and gluten intolerant but everyone else in the family loves chocolate cake and peanut butter cake, so how can I go wrong? I don’t think you can, I feel bad you can’t have a piece. Hope your family enjoys it. All these recipes look so wonderful but unfortunately I am diabetic, do any of u have any good tasty cake,cookies or. Candy recipes I might try also salads like congealed would be great. I love to read all the nice comments u ladies leave. Please help me if u can. Thanks and happy baking girls !! Probably a stupid question…can you hand mix ingredients or do you need to use a mixer? Thanks and can’t wait to try it! it would be a lot easier with a mixer. I’ve never done it with hand mixing. Does it matter what kind of PB? I don’t think so, I use Smooth when I make it. The brand shouldn’t matter at all. so do you think that crunchy peanut butter would lend a good crunch to it along with or in place of the butterfingers? Does the cake have to be cooled before adding the chocolate topping? Yes it should be cooled. I just made this but the cream cheese layer didn’t get solid. It is still very runny. What did I do wrong? I followed the recipe to the t. I don’t know what happened. Hi Jen, I don’t either. I have made this several times and it works for me. I am wondering if it needed to be in the oven longer. Ovens can vary greatly. This cakes do take a long time to set up. How long did you bake it? By small I assume you mean the “regular size” Butterfingers???? I used the ones that are usually a dollar I think there are 5 in the package. I used 3 of the regular sized Butterfingers. I don’t think anyone will notice with all the other decadent ingredients in the recipe! Thanks for sharing! I am GlutenFree, could I possibly use GF Choc. Cake Mix? I just glanced at the other recipes, would I be able to use GF Mixes? I have never tried GlutenFree cake mixes so I don’t know how it would work. I’d give it a try and see. If you do can you let me know please? do you mix the cake mix as directed on box or use dry with ingredients I your recipe? You don’t use the box directions, use the one with the recipe and those ingredients. Can this be made into a 13×9 if I double the recipe? There is no way it will all fit in a 9 x 13 pan if you double it. I would make 2 pans. 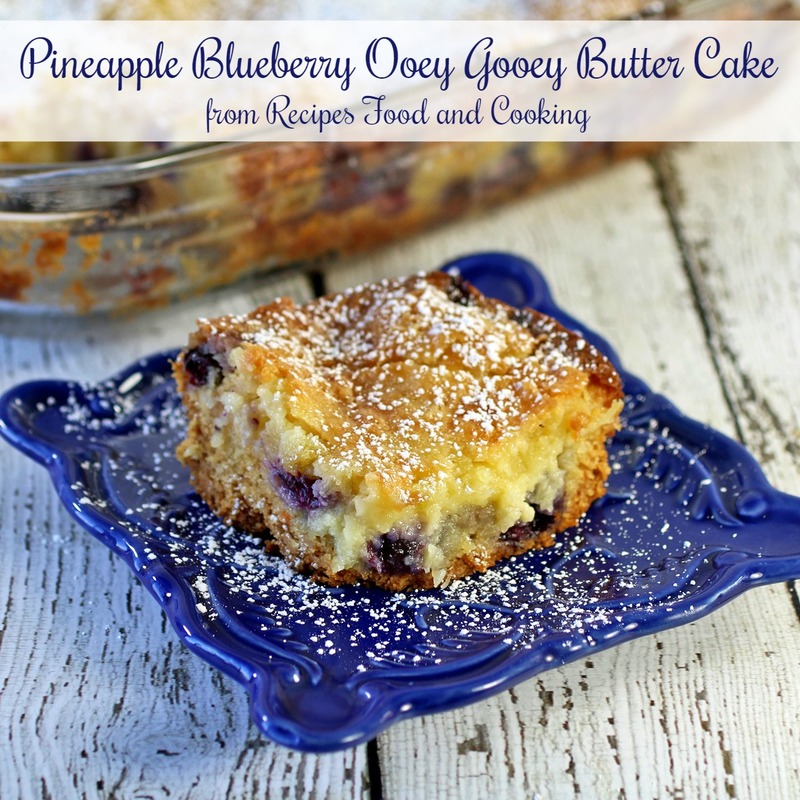 I use a 9X13 pan on all of the gooey butter cakes that I make, it works perfectly. 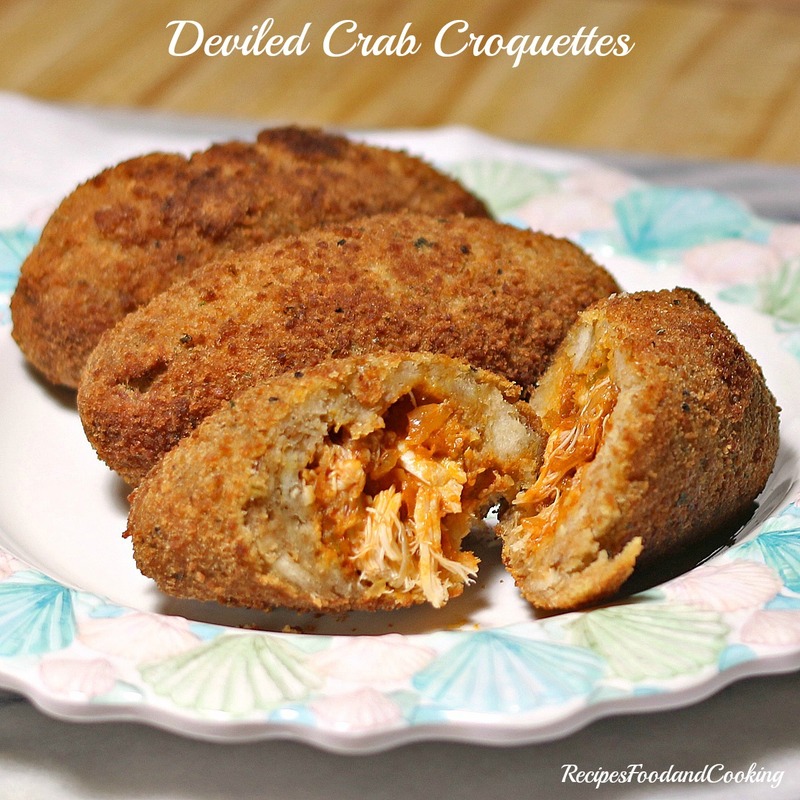 This recipe looks easy and delicious! I will have to give it a try! In the process of making this and just now realized I put on the final layer BEFORE putting in the oven (meaning, the icing is now on the cake)! UGH … We’ll see what happens. Oh no! let me know what happens! It seems like it should be fine… let’s hope. I do have one that is going to start in June. How does one get on your newsletter mailing list? This is the first of your posts I have read and I’m interested in your newsletter. How do I subscribe? I bet Butterfinger bites may work great. I think when I make it, I will try it. This looks so good. They would work great Jennifer! Signing up. Your recipes look Wonderful. Thanks! Thanks! hope you come back often! By large peanut butter cups, do you mean the two packs or the king size peanut butter cups? Can’t wait to try it. Sounds delicious!! I get 6 in a package. I try to place them so everyone gets a peanut butter cup in their serving. Of course if you cut smaller pieces that 12 pieces this might not work as well. I don’t understand. The recipe says 8 large PB cups. Above you say you get 6 in a package. Do you use 8 or 6? When you say “everyone gets a PB cup,” do you mean a “whole” PB cup, or a “piece” of a PB cup. Sorry for the questions. I would like to make this (without the Butterfingers), it looks so good! I buy 2 packages of 6. Leftovers around here get eaten quickly! No problem ask as many questions as you need to. I’ve added another note to the recipe so check out note 2. I thought the same thing when I first made it! LOL….. I love chocolate and peanut butter! Can’t wait to try this cake! However I don’t have a 9×12 pan. Can I just use a 9×13? Yes you can! It will be fine. Do you think I could make this cake a few days ahead of serving it? Should I freeze or just put in fridge? I’m actually making this cake for my own birthday it looks so good! I want to make it in Wednesday and serve in Saturday. I think it would be okay. Just cover it tightly when it is cool and refrigerate. Let it start to come back to room temperature before serving. Happy Birthday! Yes you can, cover it tightly and refrigerate. Let it come to room temperature before serving. Have you ever made this recipe with a brownie mix instead of a cake mix? That seems like it might give it a nice chewy texture. But wondering if the cooking time would change? Looks delicious. My niece has requested that I make it for Memorial Day weekend at the cottage! I have made one with a brownie mix it worked fine. It might change the time, I’d just watch it. Enjoy it at the cottage, sounds like fun! Hi. I’ve just found this recipe on Facebook and would love to try it – I love anything with peanut butter! However, I’m in the UK so don’t recognise some of the ingredients – hope you can help. (1) What is German Chocolate Cake mix? (2) I don’t think we have Butterfinger Candy Bars in UK. If you describe them, maybe I could find an alternative. (3) Is Confectioner’s Sugar the same as Icing Sugar/Powdered Sugar? It is just the flavor of a cake mix here, you can use any chocolate cake mix at least 16 oz. I’d skip the butterfingers if you can’t get them, add in a few more peanut butter cups. Yes it is the same as powdered sugar. Soo rich!! Cream cheese layer, didn’t get done! ;( it was gooey, should it have been more set!?? Thinking next time I make it, I may cut the powder sugar to 2 cups, 4 seemsed too much!! What about putting chocolate frosting on top instead of the melted chips? Would I be able to spread it over the cream cheese layer easily? This is baking now. My house smells like peanut butter heaven. I’m worried about undercooking so I put a little foil on the edges when they got as dark as I like them. Can’t wait to dig in! Wish me luck LOL. I am making this as the desert tomorrow when I cook a late mothers day dinner for my girlfriend and her mom. Hi Ralph, I bet it will be great with rolos! Lucky mom and girlfriend! Hi Monica! I hope he enjoys it…. This is really rich so you can do small pieces. It should easily serve 10 – 12. Will this recipe work in a spring form round pan, the kind you use for cheesecakes? I’m not sure. I’ve never tried it. If you do I’d wrap the pan in foil to be safe. I love expirimenting with recipes and this one is so much fun! I’ve made it several times and each time was different but amazing! The first time I used kit kats because I didn’t have any butterfingers, next I used butterfinger Krisps and right now it’s cooling off after I simply used chocolate and peanut butter chips since i didn’t have any candy bars and I topped it with white chocolate. I plan to use heath chips next time :) thank you!!! 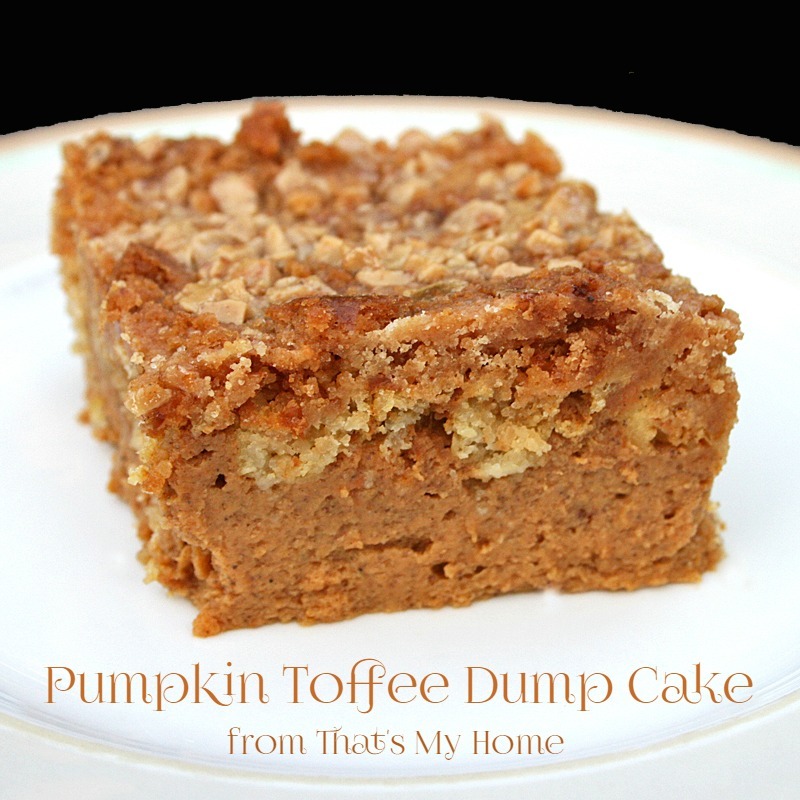 this might sound a silly question but what is the font you use on the photos of the peanut butter ooey gooey cake and the pumpkin toffee dump cake? What would be a good substitute for the cream cheese in your chocolate peanut butter devils food cake? I have a few family members who don’t like cream cheese, but would love the rest of the cake. I am not sure what you could substitute but I would almost bet if you don’t tell them, they might not guess. With all of the flavors going on you really don’t taste it like you would in a cheesecake. If the cream cheese is still runny should it cook longer? I just saw this on Facebook, I can’t wait to try it! How do I receive your newsletter once it is up? Just made it for Father’s Day …..can’t wait to taste it!! I have made this a couple of times and, when I remove it from the oven to cool, the whole top caves in on itself. Should I be cooling it in the oven? Do you have any other suggestions? This is an amazing recipe and I would like it to be as pretty as it is delicious. Thanks. Thanks Mary! I love that it was a huge hit!!! I’ve got a new one coming out soon, I so love making these cakes. Sooo excited to make these for my boyfriends birthday this weekend!! You’re welcome! I hope he loves it. Just remember when baking the center will puff up just before it is done. It will fall as it cools. Are they okay stored out of the fridge? These all look so great. Wishi could do them. Have a grandchild allergic to cream cheese? Could you substitute mascarpone cheese instead? Cannot wait to try this out – thanks for posting! I haven’t tried freezing them so I am really not sure. Sorry.